Dancing with the Stars' opening number cranked up the crazy to epic with last night's dance montage. IT WAS INCREDIBLE. The number began as a western and ended as a ballroom-dancing Jedi-Sith battle. PEOPLE, THERE WERE SEQUINS AND LIGHTSABERS INVOLVED. It was a sign of the geekiness to come. The evening centered around famous film scores and nerdy dance numbers abounded with Indiana Jones, Pirates of the Caribbean, Flash Gordon, Toy Story, Superman and Psycho. 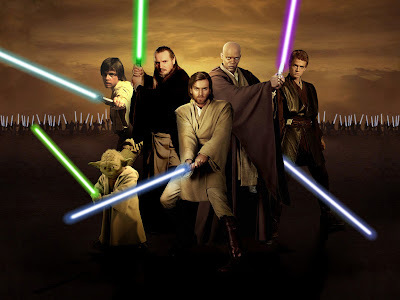 While the dancing Jedi portion isn't available online yet, the others are and we've got the best of the night for you. Watch 'em after the jump! While the other two were silly, the Psycho number was actually a gorgeous amateur dance and a beautifully choreographed one by Ricki Lake's professional partner, Derek Hough. Wow - the Psycho one was really well done. Ricki is doing way better than I originally thought, but then I have to remember her from her Hairspray days and not the talk show portion of her career. Thanks for posting! OK I never watch this show, but the Psycho tango was REALLY cool.